LOWER MANHATTAN — Denny’s is going upscale. The nationwide chain of diners known for cheap eats is looking to open its first New York City outpost in a 23-story luxury condo building Downtown — and serve wine and beer. 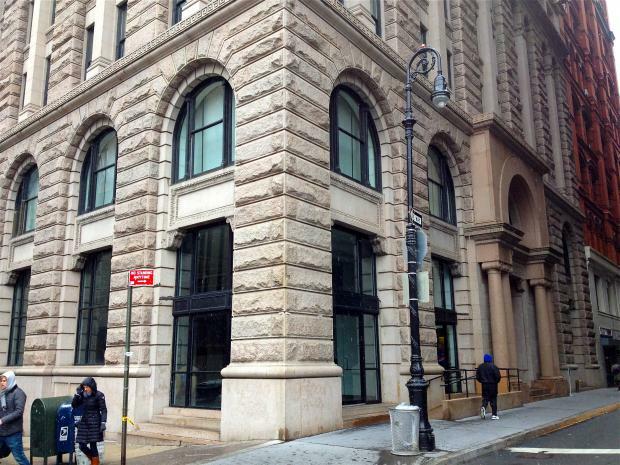 The restaurant signed a lease last year for the ground-floor spot at 150 Nassau St. — a landmarked building that sits across the street from City Hall — the Babaev Group, the real estate firm that owns the space, confirmed to DNAinfo.com New York. But the residents of the building, home to multimillion-dollar apartments, are not pleased with the new tenant. Denny’s applied to Community Board 1 for advisory approval of its beer and wine license on March 14, but has decided to postpone its appearance before the board until May, according to CB1. CB1 has already received several complaints from residents of 150 Nassau and surrounding buildings who don't want "America's diner" in their immediate neighborhood. Residents fear that their home, which sits next to a Pace University building, will be transformed into a hangout for college students attracted by the cheap drinks and food. "I have two young children and this is a quiet, family place," said the resident. "A landmarked building is not the right home for a Denny's." Several residents said their biggest concern is the possibility that the restaurant will be open 24 hours a day. "I have no problem with Denny's," said Michael Marton, president of the condo board for neighboring 140 Nassau St. "I just don't think a 24-hour restaurant should open on a very quiet, residential street." A Denny's spokesman declined to comment about the Nassau Street location, but said the usual model for Denny's is to have round-the-clock service, although they do make accommodations for specific franchise owners and their neighborhoods. Once a commercial space, the building, erected in 1896, was converted to condos in 2003, said a longtime 150 Nassau St. employee. The ground-floor retail space, which was home to a Taco Bell when the building was populated with offices, has been empty since the residential conversion, the building employee said. The Denny's spokesman said the company has had its sights on Manhattan for a long time, but opening in the new space is "not set in stone." The 60-year-old chain has 1,680 locations across the country.